On the rooftop garden at St. Philip’s Academy, a private school in Newark, students tend plots of everything from broccoli and beets to sweet corn and spaghetti squash. 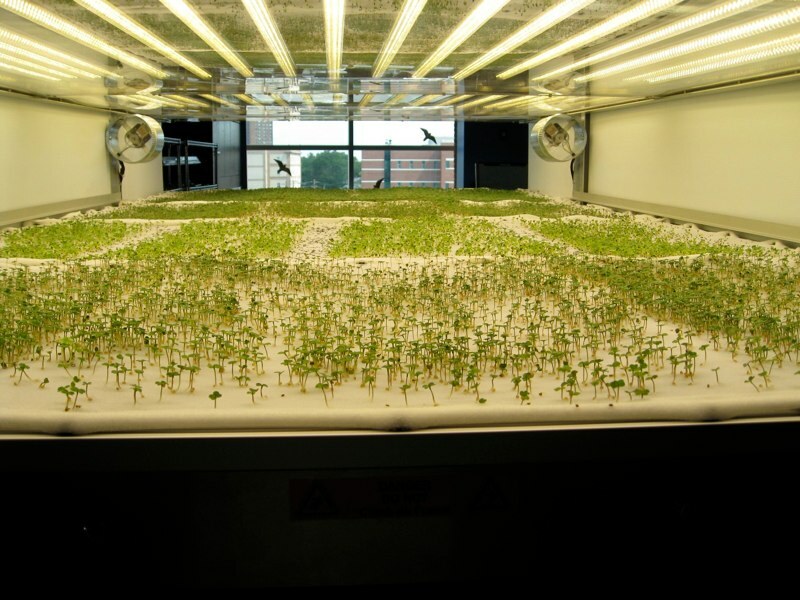 But since August they’ve also been helping to farm arugula, chervil, fun jen, and komatsuna in a machine installed in a fourth-floor science classroom that grows crops without soil or sunshine. Made by an Ithaca, N.Y., company called AeroFarms, the aeroponic growing system is owned by EcoVeggies, a startup formed by former three Wall Street technology workers who aim to transform Newark’s abandoned and vacant buildings into so-called vertical farms. “The produce will sold and used in the areas immediately surrounding Newark to start with and then we expect to be able to service the immediate tri-state area,” Richard Charles, one of EcoVeggies founders, wrote in an e-mail message. At St. Philip’s Academy, leafy greens are planted in a cloth bed and irrigated with a nutrient-infused mist. Light is provided by LED lamps, which are more energy-efficient than conventional lighting and can be placed closer to the beds. The LED lamps also provide pest control, according to AeroFarms’ chief executive, Ed Harwood, because they can be set to emit certain wavelengths that disrupt insects’ breeding. AeroFarms is leasing the machine, which stands 7 feet tall by 10 feet long, to EcoVeggies for use in the pilot project at St. Philip’s. It can produce about 20 pounds of produce per harvest, Mr. Charles said. EcoVeggies and AeroFarms are part of the sustainable agriculture movement, sometimes called Agriculture 2.0, which seeks to combine technology and organic farming to grow crops in urban areas that often lack access to fresh food.